Microsoft's earnings once again grew on the strength of its cloud services. Microsoft exceeded $100 billion in yearly revenue for the first time in its history, the company reported Thursday. The Redmond tech company announced a revenue bump of more than 17 percent to $30.1 billion for its fourth quarter of the year, continuing its recent trend of beating Wall Street analyst expectations nearly every period. Once again, the company’s earnings showed strength in its cloud business, where it has increasingly thrown its backing in the last year. The company reported quarterly profit of $8.9 billion, or $1.14 per share. Analysts were expecting earnings per share of $1.08 on revenue of $29.2 billion for the last quarter of Microsoft’s fiscal year. Several key businesses in Microsoft’s portfolio saw sales gains during the quarter, including its expanding commercial cloud business, which jumped 53 percent to $6.9 billion. That groups the company’s cloud-computing business Azure, with the subscription cloud-based Office 365 and sales software Dynamics 365. The company again noted an increase in Azure revenue — this quarter by 89 percent. That’s down slightly from an increase of 93 that the business reported in the third quarter. Microsoft does not break out revenue numbers for Azure. In recent weeks, Microsoft has announced several expansions of cloud deals with prominent business players, including GE and Amazon competitor Walmart. 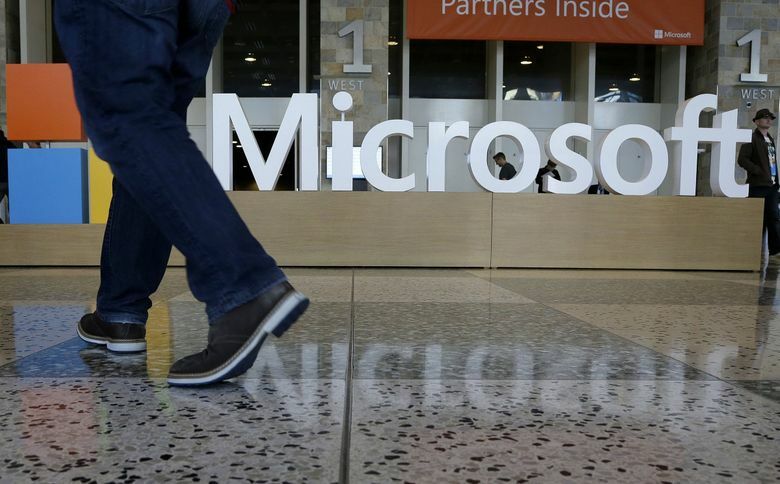 For the full year, Microsoft said it earned $16.6 billion on $110.4 billion in revenue. The numbers boded well for Microsoft’s biggest acquisition in recent years, of professional networking site LinkedIn. The division’s revenue was up 37 percent in the quarter. The company’s legacy Windows products fared well too — revenue from the business was up 11 percent, or $532 million. Microsoft underwent a major corporate reorganization this spring to focus its business on its expanding cloud products and shift away from Windows, while being careful to express that it was still paying attention to its longtime stalwart. Microsoft shares were up 3.2 percent to $107.78 in extended trading Thursday after the results were released and the company offered better-than-expected forecasts during an afternoon call with analysts.